President Trump says you can sleep better, now that North Korea is no longer a threat. Rob Malley of the International Crisis Group joins the panel to evaluate that claim and talk through some of the president's other shocking statements praising Kim. Things are not going so well with our trading partners. One of Trump's top trade advisers said "there's a special place in hell" for Canadian Prime Minister Justin Trudeau, who won't agree to the president's terms on NAFTA. And, for good measure, the president announced new tariffs on China. Immigration reporter Dara Lind discusses the week's developments on the border — family separation, what's happening at legal ports of entry, stirrings of legislation in the House, and how successful asylum seekers have been under previous administrations. The panel discusses a future with legalized sports betting with economist Andrew Zimbalist. Who wins and who loses when there's money — billions — on the game? 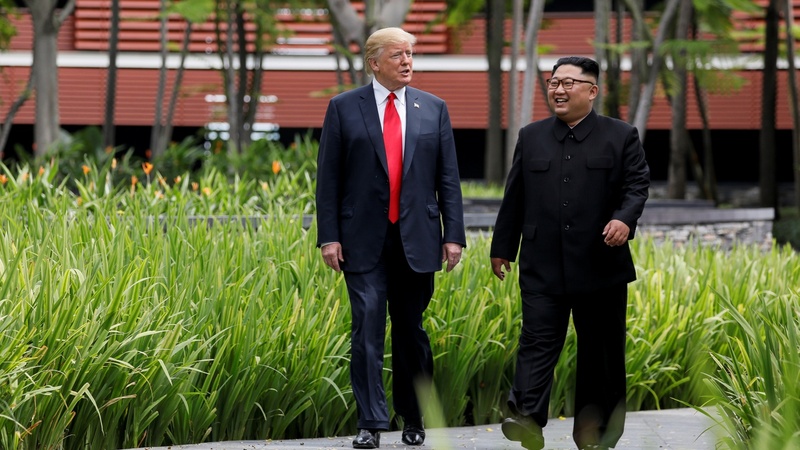 U.S. President Donald Trump and North Korea's leader Kim Jong Un walk together before their working lunch during their summit at the Capella Hotel on the resort island of Sentosa, Singapore. Picture taken June 12, 2018. Photo credit: Jonathan Ernst/Reuters.